We have now run three Deep Sea fishing charters here in Fort Lauderdale within a couple of days either side of Hurricane Matthew. We ran a trip the day before the storm on the last day of good weather and the fishing was very good with a nice Wahoo the fish of the day for Steve and his friends who drove over @ 4 Am from our Gulf coast side, having moved the charter up a day to beat the weather and to get in on the expected good fishing here when storms draw near. The day did not disappoint. The weather was great Wednesday morning as forecast and it was difficult to imagine that storm down below us chewing up Haiti and then approaching the Southern Bahamas as a Catagory 4. We shut down and got secured for Thursday and Friday as the storm approached. And luck was on our side here in Southeast Florida as the bulk and main fury of the storm passed by offshore and Friday afternoon the weather was much improved and we brought the boats back to dock A here @ Bahia Mar Marina. Soaped off the dirt left from the wind and with not a bit of storm damage we geared up for Saturday’s charter. We were very fortunate here with that storm passing offshore to the East of us. Saturday was sunny and pleasant with a slight swell and basically calm sea conditions. No rain. Again the fishing was good. This afternoons charter was once again fished under a bright and sunny sky. Good fishing once again good with that pictured Sailfish the fish of the trip for our resident Fort Lauderdale angler Itai along with his kids and family. Tight lines, good fishing, and sooooo long to hurricane Matthew from all of us relieved residents of South Florida. Many of us here have been there / done that, and believe me, for sure once is enough. So the fishing is good and the boats are back in their regular slips and with only the customary six lines securing them. The hurricane gear is all back in storage. And the patio furniture is back on the deck with the shutters on the windows again open letting that sun shine in. 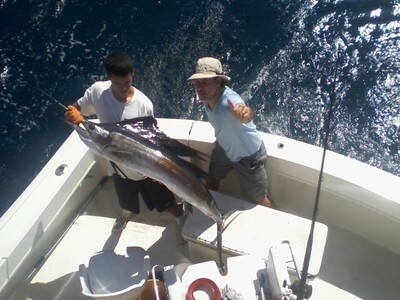 Life is good here once again in Ft. Lauderdale and we are happily back to fishing and enjoying South Florida. We were very lucky.